Hello Linux Geeksters. 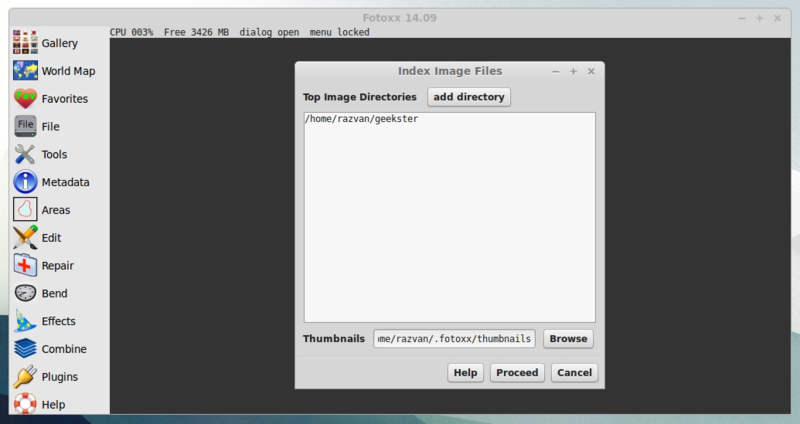 As you may know, Fotoxx is an open source photo editing program, working on Linux. It has support for the most important image formats, including JPEG, BMP, PNG, TIFF and RAW. Fotoxx is mostly used for cropping, resizing or retouching photos, without using layers, like Photoshop. Dialogs set focus back to the main window after use of the [apply] or [next] button, so subsequent KB shortcuts will work without extra mouse action. File Save: both unsaved metadata edits and image edits are now saved. Display “no more images” after deleting the last image in the current gallery (otherwise the window goes inexplicably blank). Additional dialogs now restore previous inputs, also across sessions. Search Images: if time is omitted in a date/time search range, then 00:00 or 23:59 is defaulted for the start or end time respectively. Search Images: new option: include only the latest version of each image. Batch Convert: If image files are renamed or moved and the originals are deleted, collections containing the images are updated automatically. The problematic Move Collections function was removed. Gallery popup images: new option: use the same window or open another window when a thumbnail is clicked. The one window option is effectively a combined image and gallery view, with adjustable allocation of screen space between the two views, and two-click selection of each image to view. Area Select: select by matching colors was made a little smarter. Gallery Selection: the selection list is scrolled to keep new insertions in view. There is a new utility function to find and display all duplicate images. Slide Show: new option to auto-replay after reaching the end. Bugfix: Manage Collections: dragging a thumbnail to the bottom of the gallery window would not scroll up if the window was maximized. In this article I will show you how to install Fotoxx 14.09 on Ubuntu 14.04 Trusty Tahr, Linux Mint 17 Qiana, Pinguy OS 14.04, Elementary OS 0.3 Freya, Peppermint Five, Deepin 2014, LXLE 14.04, Linux Lite 2.0 and other Ubuntu 14.04 derivative systems. Because it is not available via any repository or PPA yet, we have to download the deb packages from the project’s site and install them by hand. I prefer gdebi over dpkg due to the fact that it also handles dependencies. Follow the instructions for your system and architecture exactly, in order to get a successful installation.